The aftermath of the Liberia civil war witnessed massive reconstruction of damaged infrastructure, this includes significant tax policy reforms as an effort to mobilise resource for infrastructure development. In 2013, the government created the Liberia Revenue Authority as an autonomous agency for assessing, enforcing, and collecting the taxes on behalf of the government as well as the establishment of Ministry of Finance and Development Planning to formulate fiscal and tax policies to enhance revenue growth. Regardless of all these efforts, there remain serious challenges for the smooth operation of the Revenue Authority. 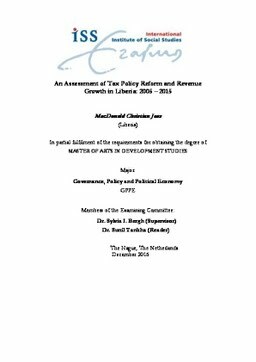 It is against this backdrop that this study assesses the effects of the tax reforms instituted by the government and its impact on revenue growth in Liberia in detail. In particular, to understand the challenges that are hindering the smooth operation of the Liberia Revenue Authority from collecting legitimate revenue for the state. In order to achieve this, a qualitative methodological approach was adopted to collect data through interviews with the key informants, which includes but not limited to stakeholders from Ministry of Finance and development Planning, Ministry of Commerce, Liberia Revenue Authority, Liberia Maritime Authority, Liberia Institute of Geo – Information Services and National Investment Commission of Liberia. The private sector led by the Liberia Chambers of Commerce amongst others. The findings of the study revealed that the tax policy still has a significant level of weaknesses and compromises. For a successful fiscal policy reform, there should be an interactive forum between the government and the private sector, especially business people as a means of finding common ground on issues of primary concern. Besides, the revenue code needs to be precise and definite in its definition of what is obtainable and what is not. It was gathered that if the ambiguity in the revenue code is removed, it will assist in generate sustainable revenue for the country. Thesis Advisor Bergh, Sylvia I.